Foster Estates is fully conversant and experienced in all aspects of the Property Management and Maintenance with a well established and dedicated, in-house workforce, who together have many years combined building experience. 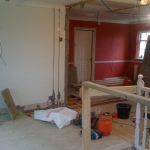 We maintain our position as one of Yorkshire’s leading residential and commercial building companies and main building contractor because we are dedicated to both quality and customer satisfaction. We pride ourselves on providing a professional and reliable service which results in superbly executed building projects and highly satisfied customers. We are based in Doncaster, South Yorkshire, approximately 15 miles west of Sheffield and operate projects across the whole of the north of England. Foster Estates generally have several projects running simultaneously. Each operating site is controlled by a designated Site Manager who is responsible for all aspects of contract execution. We have an open and transparent ethos of communication and forward planning which ensures that each project is completed successfully on time and to budget. The Health and Safety of our workforce, clients and clients’ representatives is of paramount importance and our entire operation is controlled by strict adherence to Health and Safety Policies. We are advised in this respect by leading Health and Safety Consultants.